ADHD is diagnosed two to four times more frequently in boys than in girls, though studies suggest this discrepancy may be partially due to subjective bias of referring teachers. Attention deficit Hyperactivity disorder is a disorder of the brain function. The cause for ADHD has biological origins that are not clearly understood. Research has shown that ADHD is common in children who have close relatives with the disorder, which may indicate a genetic predisposition. However, no one cause of ADHD has been identified. A child or adult having difficulty reading or learning to read, following simple verbal instructions, or paying attention, may seem to have ADHD, but in fact dyslexia, a learning disorder involving reading difficulties might be the problem. When these types of problems arise, a thorough evaluation for dyslexia before considering a label of ADHD might reduce the chances of misdiagnosis. If recognised, dyslexia can be overcome with the correct therapy and does not require drugs for treatment. Although dyslexia is one of the most common specific learning disabilities, it’s not always identified in school. Many parents and professionals are more aware of attention deficit disorder checklists than one for dyslexia. If your child shows signs of academic struggles don’t just assume they’re being lazy. There may be something else at work. 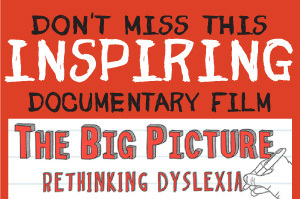 ADHD might be a big buzz word in the media, but dyslexia is far more common. And the earlier it’s diagnosed, the sooner help can arrive. Visual dyslexia can mimic some of the symptoms of ADHD. Due to the continuous loss of fixation at the eyes spotting point, the person cannot maintain their focus, and attention is lost. This happens continuously throughout their life and at a rapid pace. For this reason a person suffering with visual dyslexia will find it difficult to remain attentive, sit still and remain calm. Dyscalculia – (or math disability) is a specific learning disability involving innate difficulty in learning or comprehending arithmetic. It is akin to dyslexia and includes difficulty in understanding numbers, learning how to manipulate numbers, learning maths facts, and a number of other related symptoms. Dyspraxia – Is a condition that causes problems with movement and coordination. It is also known as “motor learning disability”. Somebody with dyspraxia finds it hard to carry out smooth and coordinated movements. Dysgraphia – Is a deficiency in the ability to write primarily in terms of handwriting, but also in terms of coherence. It occurs regardless of the ability to read and is not due to intellectual impairment. Dysgraphia is a transcription disability meaning that it is a writing disorder associated with impaired handwriting, orthographic coding (orthography, the storing process of written words and processing the letters in those words), and finger sequencing (the movement of muscles required to write).